Sri Lanka was blackballed and lost its GSP+ concession in August 2010 due to allegations of human rights, resulting in a loss of export revenues till the reinstatement of GSP+ in May 2017 of Rs. 150-250 billion. 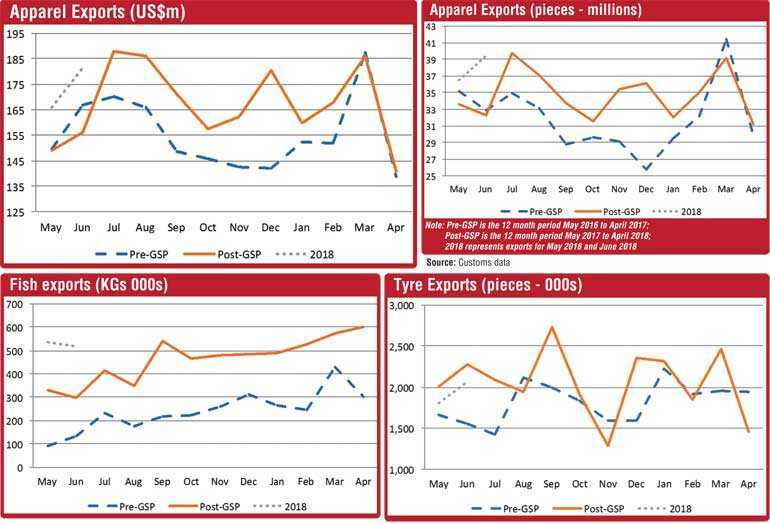 While it is difficult to provide a full analysis of what was lost, looking at how Sri Lanka’s competitors fared in the EU market, give some sense of how Sri Lanka lost out to Asian apparel exporters. According to the International Trade Centre, Vietnam, Pakistan and Cambodia all trailed Sri Lanka in 2009, with EU exports at $ 2.1 billion, $ 1.5 billion and $ 1.09 billion, respectively, against Sri Lanka’s $ 2.3 billion. By 2015, however, Vietnam’s apparel exports to the EU had risen to $ 3.9 billion, Pakistan’s to $ 2.9 billion and Cambodia’s to $ 3.7 billion, with Sri Lanka trailing at $ 2.4 billion. The European Union (EU) reinstated the EU GSP Plus facility to Sri Lanka with effect from 19 May 2017. Importantly, this will provide Sri Lankan exports a level playing field with other countries such as our neighbours from Bangladesh and Pakistan, and several countries from Africa and South America who enjoy preferential market access. 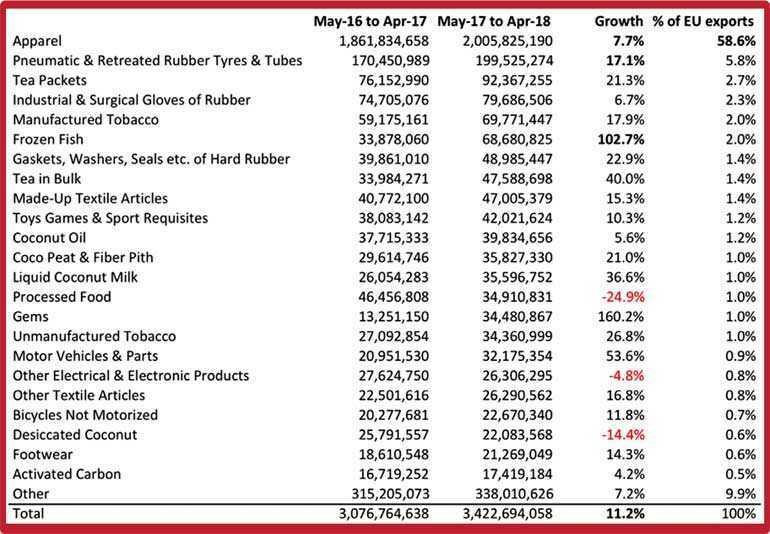 The additional tariff concession gained by sectors varies – in many apparels categories duties are cut from 9.6% to zero, in the seafood sector from 18.5% to zero, in the fresh and processed fruits and vegetable sector from 12.5% to zero, in the porcelain and ceramic ware sector from 8.4% to zero and in the toy products sector from 1.2% to zero. GSP Plus offers incentives in the form of duty reductions on exports as a reward to developing countries for their commitment to upholding the 27 core international conventions on human and labour rights, sustainable development and good governance. Then the country must also be considered ‘vulnerable’ under two conditions – the country is not competitive in the EU market (the import-share ratio is less than 6.5% of the EU’s total GSP imports) and the country does not have a diversified export base (seven products account for over 75% of that country’s total GSP imports to the EU). Apparel is by far our biggest export to the EU. Given that the Rules of Origin under GSP Plus requires fabric to be sourced from Sri Lanka or from an area that qualifies for regional cumulation in order to qualify for GSP Plus, there will be an increase in demand for fabric sourced from Sri Lankan fabric mills, rather than from countries such as China. Sri Lanka will continue to be eligible for GSP Plus as long as the periodic reviews (the first one coming in less than a year) by the EU do not raise any red flags with regard to the implementation of agreed human rights and governance reforms. Yet, once the country graduates to an ‘upper-middle-income economy’ status (as classified by the World Bank) and remains at that classification for three years, then Sri Lanka becomes no longer eligible for GSP Plus (with a grace period of around two years). Thus, we should have the GSP Plus benefit till 2023. Producing higher quality products and following ethical practices will become key strengths for Sri Lanka. Further, Sri Lankan companies are progressively moving towards and practicing sustainable production concepts such as the organic produce, green production, as well as Fair Trade practices which are highly valued by the consumers world over and in particular in the EU. The ability to penetrate the EU market as a strong country respecting basic human rights, rule of law and good governance would send a strong signal to the international investor community which will facilitate the attraction of inward FDI. The GSP+ scheme encourages increased value addition within Sri Lanka, and thereby promotes backward integration, resulting in the setting up of new industries, and creating new employment opportunities in the country. Benefits of GSP-Plus status will need to trickle down to Sri Lanka’s rural workforce. The concessions under GSP+ are likely to have assisted the financially less privileged farmers who are engaged in agriculture and fisheries industry in Sri Lanka. New export opportunities will eventually develop the livelihoods and raise income levels of the farmers. Sri Lankan exporters can also exploit the potential for agro-based processed food exports in collaboration with European companies through joint ventures and transfer of technology. Small and Medium Enterprises (SMEs) need to be encouraged to work more effectively and be part of the value chains of larger companies.Manufacturers are confident on overcoming production capacity constraints by doubling the work shifts and automating the production process. 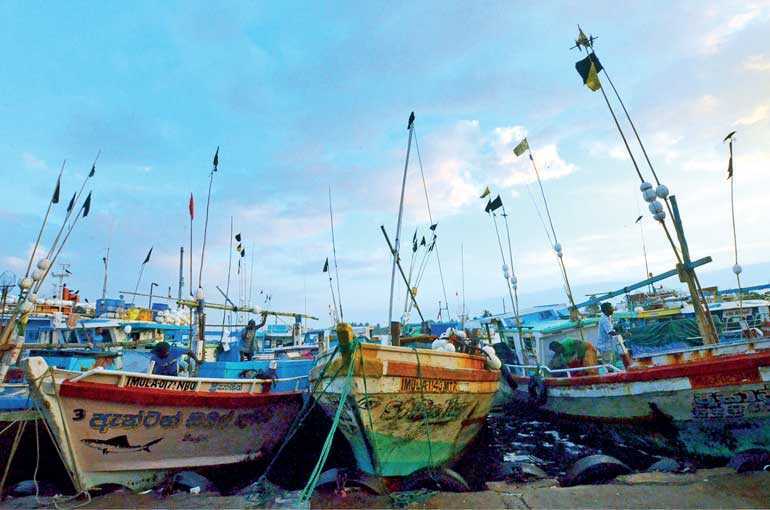 Meanwhile, the seafood exporters cautioned that the noticeable decrease in live fish in the Sri Lankan deep waters is posing a threat to the medium to long-term ability of the sector to meet new demand. The UK market accounts for a third of our EU exports. With the impending Brexit, one needs to be cognisant of establishing a mechanism to maintain our preferential market access to this key region. In 2017, Sri Lanka had the highest ever export earnings of 15.1 billion dollars and this year it may rise further to 17.4 billion dollars. 2017 was also a record year for foreign investment. FDI inflow was a record 1.9 billion dollars last year and in 2018 it may rise to around 2.5 billion dollars. However, these are extremely low figures in comparison to some of the other Asian countries. For example, annual exports in Singapore is 480 billion dollars, in Taiwan it is 340 billion dollars, in Thailand is 254 billion dollars, in Vietnam it is 250 billion dollars, and in Malaysia it is 230 billion dollars. Even Bangladesh, a country that was a much later entrant to the international trade game, is now at 41 billion dollars. Foreign Direct Investment received by these countries were 77 billion dollars to Singapore, 12 billion dollars to Vietnam, nine billion dollars to Taiwan, and five billion dollars to Thailand. And all these countries focused on FTAs, trade liberalisation, and attracting foreign investment, to reach this level. All of these countries have been able to grow their economies and bring more good jobs and raise people’s living standards, within a short period of time. What is very clear is that Sri Lanka has a long way to go, and if we concentrate only on our market of 21 million people, we will never be able to achieve the rapid economic development that we need. Our only choice is to integrate with the world markets, and this is one of the primary reasons for the FTAs – to enter into new markets and bring in the investments we need along with new technology and know-how so that we can compete with the best in the world. We would encourage and invite FDI from the EU. In addition, to GSP+ we have executed the Singapore FTA earlier this year, we are in the advance stages of negotiating a FTA with China, and expanding our current FTA with India through Economic and Technology Cooperation Agreement (ETCA). ETCA can increase Sri Lanka’s competitiveness in industrial exports and also increase our supply capacity, to better utilise the market access to India. In addition, ETCA negotiations are addressing outstanding non-tariff barriers in the Indian market as well as many of the existing procedural barriers and delays in Indian ports of entry, particularly through Mutual Recognised Agreements. Together the Chinese FTA and Indian ETCA will give Sri Lanka preferential access to a market of two billion people and an emerging middle class larger than the whole of the EU. The Government of Sri Lanka is aware of the possible trade disruptions that can occur during the transition period and therefore we are looking at providing a trade adjustment package for local industrialists to upgrade machinery and introduce new technology so that these industries can be more competitive and serve the local market as well as export to the regional and global markets. The Government is committed to improving the Ease of Doing Business in Sri Lanka under the theme Sri Lanka means business. We have set the ambitious task of jumping 40 places in the World Bank’s Ease of Doing Business index by 2020 and are conscious that other countries are not remaining still. Together with the World Bank we have developed a road map to eliminate unnecessary regulatory and procedural obstacles.